Home Journal Entries What is the Journal Entry for Discount Received? Discounts are common in both B2B and B2C transactions to push both credit and cash sales, they are usually given in lieu of some consideration which can be prompt payments, trade practices, recoveries, etc. While posting a journal entry for discount received “Discount Received Account” is credited. 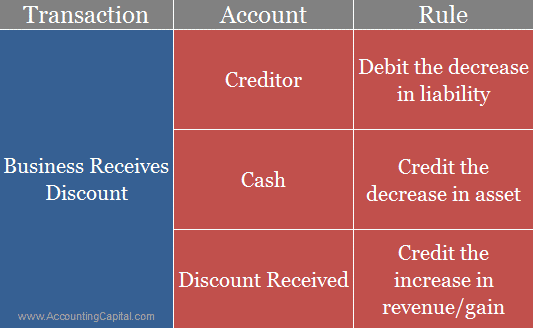 Discount received acts as a gain for the business and is shown on the credit side of a profit and loss account. Trade discount is not shown in the main financial statements, however cash discount and other types of discounts are shown in books of accounts. Journal entry for discount received is essentially booked with the help of a compound journal entry. After it is journalized the balances are pushed to their respective ledger accounts. Discount received ↓ increases the income for a buyer, on the other hand, it also ↓ decreases the actual amount to be paid for purchases. Discount received by a buyer is discount allowed in the books of the seller. Following examples explain the use of journal entry for discount received in the real world scenarios.